Several famous writers wrote about Mexico despite having no direct geographic experience of the country. In an earlier post, we looked at the case of Jules Verne. This time, we look at Henry Wadsworth Longfellow. There is some sound historical geography in the famous poem The Bells of San Blas, yet author Henry Wadsworth Longfellow had never ever visited the town. The San Blas referred to in the poem is on the Pacific coast, in the state of Nayarit. It is a small town with several good hotels and restaurants, and a birding “hot spot”. The variety of habitats around the town, ranging from sandy beaches and luxuriant mangroves to palm plantations and tropical swamps, have attracted more than 500 different bird species, or about half of all the bird species known in Mexico. The town’s economy was not always geared to tourism. For more than a century, San Blas, founded in 1768, functioned as an important port and boat-building center. The vessels built in San Blas included those used by Junípero Serra to establish missions in California. To ensure that taxes were paid on imports, an imposing customs house was built on the shore. To guarantee safe passage, a church dedicated to “Our Lady of the Sailor’s Rosary” stands atop the steep-sided Cerro de San Basilio which overlooks the town. In the church hung the famous bronze bells. 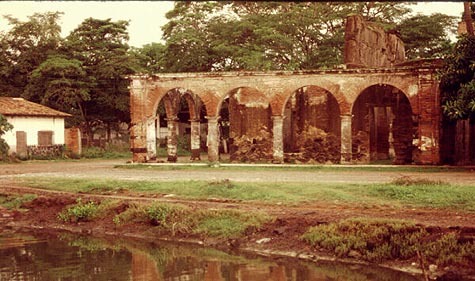 ﻿The former Customs House of San Blas in the evening light, 1989. Photo: Tony Burton. All rights reserved. Time conspired against the port of San Blas. The harbor silted up, the coastline gradually inched its way further west. Over the years, other ports such as Acapulco and Mazatlan became more important. San Blas declined. The customs house and church were abandoned, transformed from bustling buildings into evocative ruins. By the end of the 19th century, the port was very much a “has been”. In March, 1882, far away from Mexico, in Cambridge, Massachusetts, the American poet Henry Wadsworth Longfellow (best known for Paul Revere’s Ride, The Song of Hiawatha, and Evangeline) lay on his deathbed. Longfellow, born in 1807, was a prolific poet and accomplished linguist. After a long and illustrious career, which included teaching at Harvard College, his life was now drawing to a close, even as the distant port of San Blas was falling into disuse. The article was accompanied by an illustration showing four bells swinging from a rickety wooden frame. 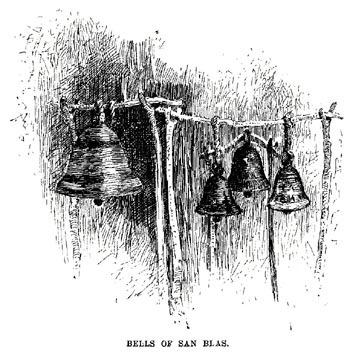 The article and its accompanying illustration prompted Longfellow to write what would prove to be his last poem, entitled The Bells of San Blas. On March 24, Longfellow, who had never had the good fortune to visit San Blas in person, passed away. Should you visit San Blas today, spare a thought for this genius of a poet who was able to capture so eloquently the declining fortunes of this once-great port. What further stanzas remain to be written in the story of San Blas, now revived by its important naval base and ornithological tourism? Thankyou for the info. We recently visited San Blas, on a day trip from our vacation home in Rincon de Guayabitos. Our tour guide was informative, but with so much history, I felt it necessary to search further. I am enjoying our holiday all over again! San Blas…. One of the only pacific beach towns that hasn’t changed very much in the last 35 years. This is do in no small part to the voracious sand flies that inhabit the beaches at dusk and dawn. That’s what you get for living next to a large mangrove swamp. Lovely birding it the area and a good jumping off place for visiting Mexcaltitan. San Blas is a fun place for exploring the surrounding nature but a bad place to watch sunset on the beach. If your going birding and looking for a ride in the mangroves. Look up “Don Chencho” … Nice guy and knows where to find what your looking for. He’s somewhere under the bridge over the river as you enter town.